Sometimes, Nature gives us unexpected gifts. 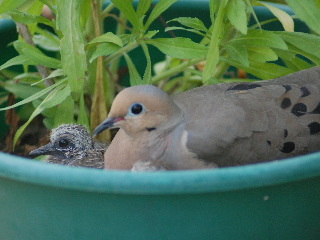 Such was our great fortune when a pair of mourning doves decided an unplanted flowerpot on our back deck railing would make an appropriate location for the birth of their little ones. I first noticed the pair on a sunny Sunday morning in early May as I moved outdoors to read the daily newspaper. 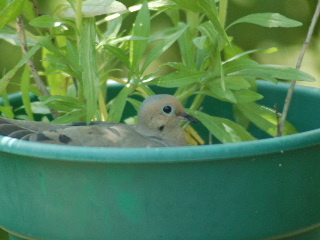 A dove was nestled into one of last season’s weedy leftover flowerpots, her head and back showing above the top edge and her long tail extending slightly upward and outward over the rim of the pot. My wife said she had first seen the bird there on the previous Friday. As I sat down at the patio table, no more than 6 or 8 feet away from the hunkered down bird, a second dove flew in and landed on the railing beside the pot. At this, the nesting dove flew away and the replacement took its place. . . .shift change time! But bird number 2 was uneasy about my presence and flew to the ground a short distance away. This gave me a chance to quickly peek into the pot, and sure enough, there in this unlikely incubator, a green plastic Wal-Mart flowerpot, sat two pale-white eggs. I picked up my paper, moved back into the house so the bird could return to the nest, and the flowerpot-dove watch was on for our family. According to the information in “Birds Of North America,” our textbook for this ornithological observation class, what we were seeing was exactly what should be happening. The mourning dove generally lays two eggs, which are then incubated for about 14 days before hatching, being kept warm by the bodies of both the male and female of the pair as they alternate turns on the nest. What we didn’t understand was why the pair chose to settle down so close to our back deck door, where traffic from our household was pretty regular and not always so very quiet. Did they somehow feel safe because we were nearby, thinking that not only would we not cause them any harm, but that we would protect them from any potential predators that did happen by? We’ll never know, but we were happy to be chosen and trusted by these wild creatures, whether their selection was based on instinct, ignorance, or confusion. Not knowing exactly when the eggs had been laid, we kept watchful eyes on the flowerpot pair, noting their almost clock-like precision as they relieved each other of egg-sitting duty to make time for the non-sitter to eat, drink, and be as merry as a mourning dove can be (have you ever heard their song?). By the second weekend after the nesters had first arrived, it seemed that there was action within the flowerpot. Not wanting to disturb the young family, we kept our distance, which made it impossible to tell exactly what was going on just a couple of shallow inches down in the pot. However, it appeared that at shift change time, the incoming dove would be very animated and was apparently feeding the little ones by regurgitating food which they would take from its beak. This could be observed several times a day, and by the end of the week, two fuzzy little heads with pointy little beaks could actually be seen taking food from the mouths of mom and pop dove. Thinking that the transfer of food from parent birds to child birds would be a great subject for photographs, I readied my camera so I could step out onto the deck anytime the feedings began. It took me several days,however, to figure out that any movement on my part resulted in no movement on their part. Surely this was animal instinct at its most basic; the greatest defense against any possible harm at this critical time in the lives of young birds that could not fly, fight, or escape in any way was to remain perfectly still when any other creature moved nearby, thus avoiding detection and possible consumption by the intruding animal. I gave up on trying to photograph dinner at the house of doves, and decided that I would be happy just to capture any image with my camera that included an adult bird and a young bird together in the nest. This I was able to do by standing on a patio chair about 5 feet away from the nest and photographing into the flowerpot with my telephoto lens. As I did this, the birds remained as motionless as porcelain patio decorations, except for the occasional blinking of their dark shiny eyes. The head of the adult was as smooth as satin, while the heads of the babies, with their spiky little feathers just starting to come in, looked like they had been showered, toweled off, and gelled it into some young punk bird frizz. As the days stretched on, the little birds grew rapidly and could be seen occasionally flapping their wings within the nest, no doubt exercising and strengthening them for the coming exit from the flowerpot and entrance into the awaiting world. This came quickly but in a series of small steps, as the parents initially coaxed the young ones out onto the deck railing where they spent their first night away from home. From here, they moved down onto the deck and then onto the ground, learning to fly in short segments, all the while being watched, and sometimes fed, by their parents. At this writing, it’s been almost a month since we first saw the Sunday morning squatters. The two little ones have grown surprisingly big in a very short time; they look like miniature adult mourning doves except that their tails are still a bit shorter. They fly very well, and sometimes land and stay for long periods of time on the deck railing near their flowerpot birthplace. What they might think or feel as they move about in their surroundings, we will never know. But what we here on the inside of the glass patio doors feel is that we were blessed to be witnesses to the turning of this amazing page in the book of Nature.